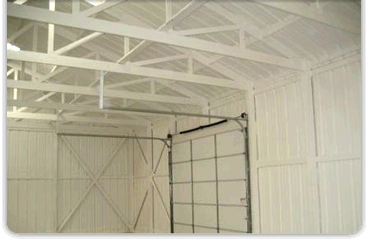 Spray polyurethane foam is the only truly effective insulation for metal buildings. No other insulating material can create an airtight seal for a constant, comfortable temperature year-round. Especially when you rely on DFW Urethane for expert application of spray foam insulation in Dallas, Fort Worth, Austin, San Antonio, Texas and Oklahoma. SPF insulation is totally seamless and self-adhering, so it won’t sag, shred or fall off. In fact, it adds structural strength, because the foam forms a chemical as well as a mechanical bond with building surfaces. Applied as a liquid, the spray foam expands and spreads into all the seams and cracks. It wraps around the metal and braces and totally eliminates air infiltration, sealing the building airtight. This prevents cold winds from blowing through in winter, and buffers the building from intense summer heat. Originating in the cold storage industry decades ago, spray foam insulation quickly proved invaluable for metal buildings. It is the high-performance standard for environments where it is imperative to manufacture, create or store products at a constant temperature. Because the tight air seal prevents conditioned air from escaping, your heating and cooling systems don’t have to work as hard to maintain the space. That means greater comfort and control, and lower utility costs. Unlike fiberglass and cellulose, spray polyurethane foam insulation also provides a complete vapor barrier. This protection is essential for metal buildings, which frequently “sweat” in humid conditions, promoting the growth of mold and mildew. DFW Urethane also provides and applies the necessary coating, as required by local code or application. Ready to start saving? Contact the leader in foam insulation in the Dallas/Fort Worth Metroplex, as well as Austin, San Antonio, Texas and Oklahoma.